Last week I wrote a post detailing my experience with CUDAMat, Deep Belief Networks, and Python using my MacBook Pro. The post is fairly long and full of screenshots to document my experience. But the gist of it is this: Even after installing the NVIDIA Cuda SDK and configuring CUDAMat, my CPU was training my Deep Belief Network (implemented by nolearn) faster than my GPU. As you can imagine, I was left scratching my head. However, since the post went live last week I’ve gotten a ton of valuable feedback. I’ve been told that my network isn’t big enough for the GPU speedup to be fully realized. I’ve also been told that I should be using Theano rather than nolearn as their GPU support is more advanced. It’s even been suggested that I should explore some compile time options of CUDAMat. And finally, I was told that I shouldn’t be using my MacBook Pro’s GPU. All of this was great feedback and it’s helped me a ton — but I wasn’t satisfied. 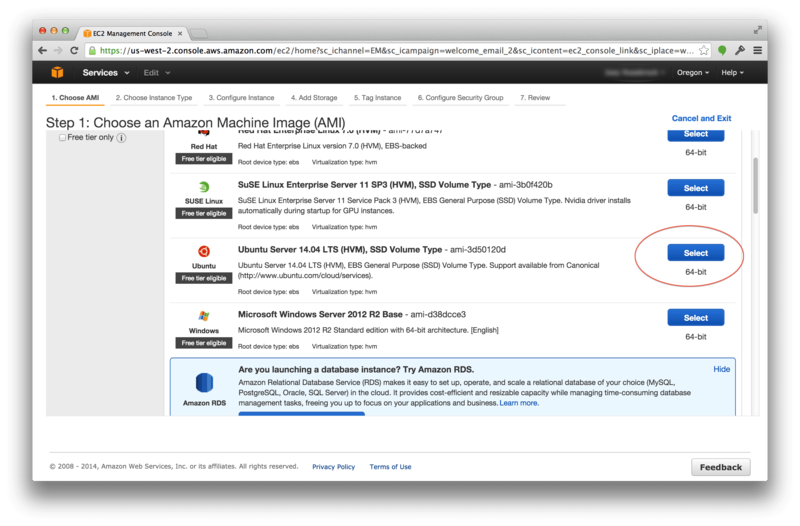 After reading Markus Beissinger’s fantastic post on installing Theano on an Amazon EC2 GPU instance, I decided to give it a try myself. But instead of using Theano, I wanted to use nolearn — mainly to see if I could replicate the problems I was having on my MacBook Pro on the Amazon cloud. And if I could replicate my results then I could conclude that the issues lies with the nolearn library rather than the GPU of my MacBook Pro. So anyway, just like last post, this post is full of screenshots as I document my way through setting up an Amazon EC2 GPU instance to train a Deep Belief Network using Python and nolearn. If you don’t already know, Amazon offers an EC2 instance that provides access to the GPU for computation purposes. The name of this instance is g2.2xlarge and costs roughly $0.65 cents per hour. However, as Markus points out, by using Spot Instances you can get this cost down to as low as roughly $0.07 per hour (provided that you can handle interrupts in your computation, of course). Inspired by Markus’ posts I decided to fire up a g2.2xlarge playground of my own and have some fun. The first thing you’ll need to do is select an Operating System for your instance. 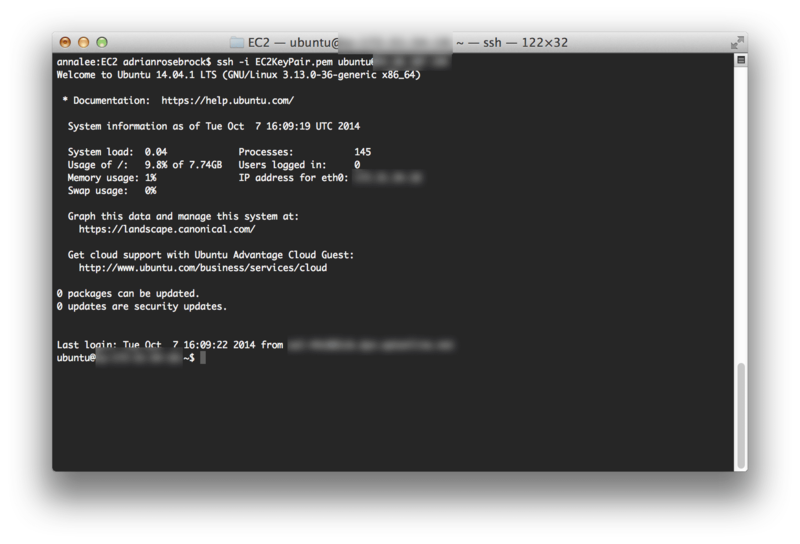 I went ahead and selected Ubuntu 14.04 LTS (64-bit) (ami-3d50120d). From there, you’ll need to select which instance you need. Amazon provides many different tiers of instances, each geared towards the type of computation you are looking to perform. You have General Purpose instances which are great for web servers, high-memory servers which are good for manipulating lots of data, and high-CPU availability for faster throughout. Be sure to select “GPU instances” to filter only the available GPU instances that Amazon provides. Here I am going to select the g2.2xlarge instance. It is important to note that this instance is not free and if you launch it you will be charged. Hit the “Launch” button and wait for your instance to start up. Wait a few minutes for your instance to startup. So far this has been an extremely pain-free process. And luckily, it continues to be pain-free throughout the rest of the tutorial. I know. It looks like a lot of steps. But it honestly wasn’t bad and it didn’t take me more than 10 minutes. Take note of Line 12. This line is downloading and caching the MNIST dataset for handwritten digit recognition to your EC2 instance. Subsequent calls to this function will be substantially faster (since you won’t have to download the data again). I mention this because if you are monitoring your training time and you haven’t already cached the MNIST dataset, you will have unreliable results. My previous post on Deep Belief Networks utilized a very tiny DBN — an input layer of 784 inputs, a hidden layer of 300 nodes, and an output layer of 10 nodes, one for each of the possible digits 1-9. It has been brought to my attention that the speedup in GPU training vs. CPU training is not fully realized until much larger networks are trained. So instead of training a tiny network, I’m going to train a substantially larger one (but still “small” in comparison to the state-of-the-art networks we see today). This time I’ll use an input layer of 784 inputs, a hidden layer of 800 nodes, a second hidden layer of 800 nodes, and finally an output layer of 10 nodes. I’ll allow my network to train for 10 epochs. 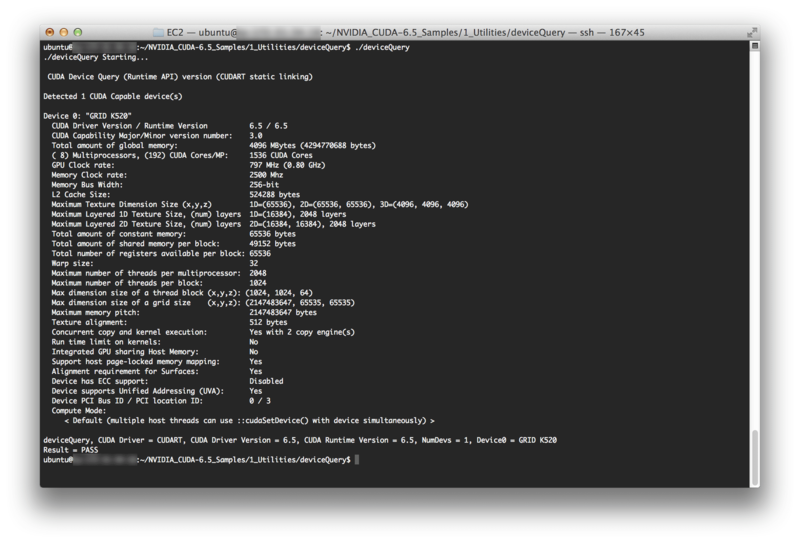 Almost 5 minutes to train and evaluate on the CPU — that’s a good starting point. Now, to train the Deep Belief Network, I moved my compiled cudamat directory into the same directory as dbn.py . Alternatively, you could add the cudamat directory to your PATH . gnumpy: failed to use gpu_lock. Using board #0 without knowing whether it is in use or not. Training on the g2.2xlarge GPU I was able to cut training and evaluation time from 4 minutes, 48 seconds to 2 minutes, 20 seconds. That’s a HUGE improvement. And certainly better than the results that I was getting on my MacBook Pro. Furthermore, the difference between the GPU and CPU training times will become even more dramatic as the size of the network increases. 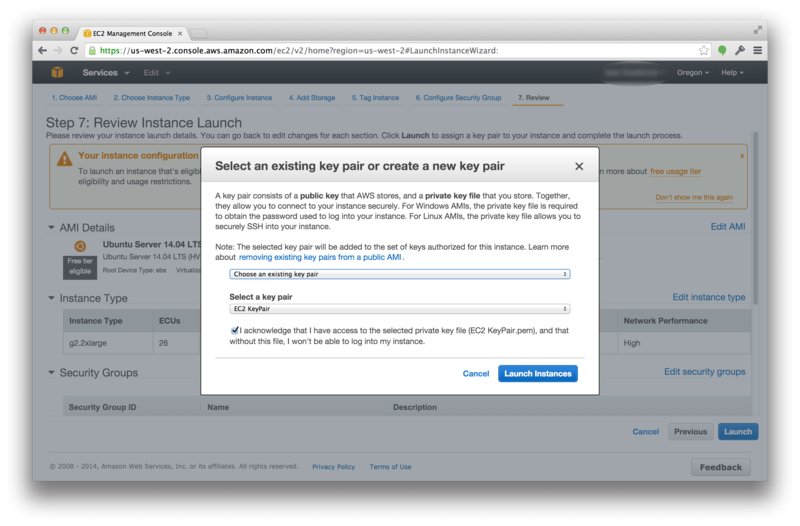 Inspired by Markus Beissinger’s post on installing an Amazon EC2 g2.2xlarge instance for Deep Learning using Theano, I decided I would do the same for the nolearn Python package. 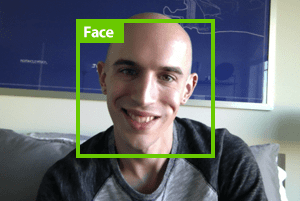 Furthermore, this post serves as a “redemption” of sorts after I tried to train a Deep Belief Network on my MacBook Pro’s GPU and obtained poor results. Your GPU matters. A Lot. The GPUs included in most notebooks are optimized for power efficiency and not necessarily computational efficiency. More importantly: The size of your network matters. If your network isn’t large enough, you won’t notice a significant improvement in training time between your CPU and GPU. There is an overhead cost transferring data to the GPU. If the amount of data being transferred is too small, then the CPU will perform more efficiently (since you’ll be wasting all your time transferring rather than computing). 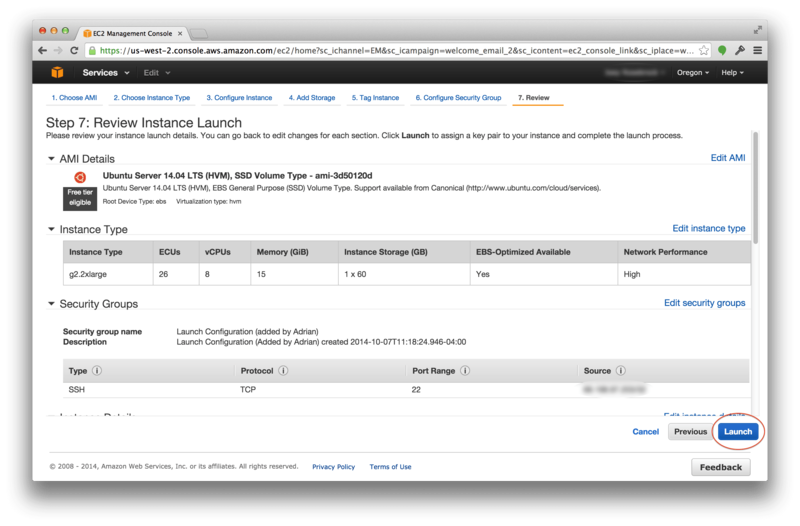 Amazon’s g2.2xlarge instance is a lot of fun to play around with. It does cost money (trade an afternoon of fun for less than a cup of coffee, it’s a no-brainer), but if you don’t want to spend the money buying a new system dedicated to Deep Learning, it’s well worth the cost. Now that had to be treacherous to get there! It was a good experience. And it only takes setting the environment up once. From there you are good to go to run any experiments. So I think the time-tradeoff for setting it all up was worth it. Very cool post; thanks for sharing. It might be interesting to see if you can have multiple EC2 instances that are parallelizing the training of DBN networks to start to get very large neural networks. I’m not sure if Theano gives this out of the box or its something that has to be built manually. It’s interesting to note that while GPUs given the fastest training time, many large enterprise companies and government organizations interested in data mining or machine learning are utilizing large clusters of systems. These systems are obviously CPU based. Therefore, I think in the next 2-5 years you’ll see more and more Deep Learning implementations developed with Hadoop in mind. These large organizations, after spending so much money creating their clusters, will not be jumping at the chance to buy even more hardware. And more than likely, these clusters already run Hadoop. I’m definitely looking forward to seeing how it works out. I takes about 5 minuts using cpu, and about 2.5 minutes on GPU. why is it that slow on my computer? Could you also figure out what the “gnumpy: failed to use gpu_lock….” message means? I’ve spoken with a lot of people about it. As far as I understand, the gist is that it’s a debug message left in the code. In this case, training a state-of-the-art CNN (in terms of time) is relative to the size of the dataset you are working with. You can get really good accuracy on CIFAR-10 in about 40 seconds on an EC2 GPU. But if you wanted to do something like ImageNet, be prepared to let your model train for weeks. At $0.65 per hour, you can do the math and interpolate from there. You could also use spot instances and potentially decrease your cost to $0.10-0.2 per hour. 1. Installation of version 6.5 is not longer supported, would need to install 7. Really great article, thanks for putting this together. No doubt I’ve done something wrong somewhere. Anyone have any ideas? I would suggest posting on the CUDAMat Issues on GitHub with a detailed explanation of your error. I wonder if there is a way of saving the neural network and loading it afterwards? And you can use similar code to read it back from disk. Hi, I enjoyed your article, but I have one comment. Your comparison does not seem to be a controlled experiment. For example, your CPU was on your MAC, but the GPU was on AWS. In fact, I find that AWS runs about 10 times faster when I do a comparison in terms of the number of CPU cores on my Windows Notebook computer vs. AWS Linux. So, the speed-up seems to be due to something in AWs, which admittedly could be the operating system (my comparison Is not a controlled experiment either). But it is interesting in that AWS rates their extra large GPU instance that you tested as equal to an extra large CPU instance in terms of the ECU units. And the cost is based upon that ECU benchmark, so it is similar. It would be interesting to see a controlled experiment. Thanks. Great feedback Dan, thanks! The next time I boot up my AWS instance I’ll re-run the experiment on the AWS server. The last time I did, there was only a marginal difference between my Mac CPU and the AWS CPU. But it’s my fault for not reporting on that. 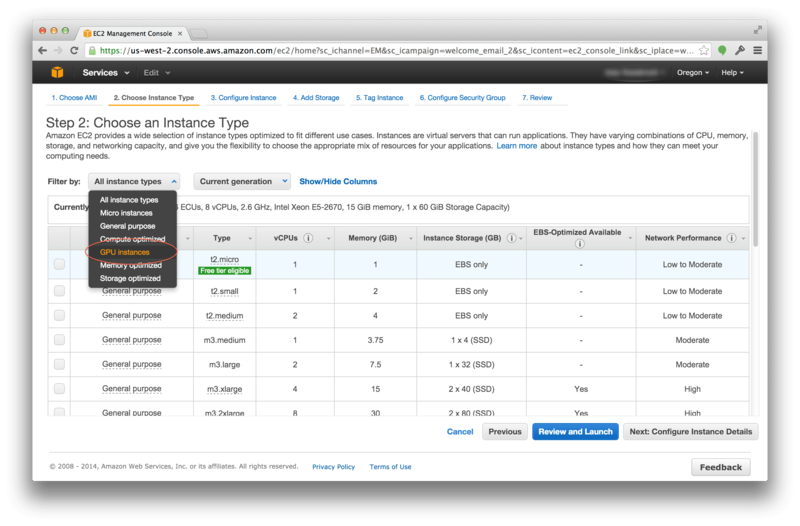 I have been thinking of using GPU services on EC2 so this is really useful info for me. i also read your earlier article on Deep Learning with python using nolearn which seemed a lot more straightforward than other options such as Theano. In that article it was also noted that dbn has been deprecated from nolearn and that you had plans to write an update about its replacement at some point – do you still have plans to do that? I still do have plans to write a second followup tutorial, I just haven’t gotten a chance to do it yet. I’ll try to make it a priority for 2016. Thanks, great tutorial! What are your thoughts on running a cluster of GPUs on AWS for deep learning? Is it cost-effective? Perhaps using apache spark. It depends on what type of network you are going to train and what your budget is. There is also a benefit of being “hands on” on the hardware and not having to foot the power bill (GPUs consume a lot of energy). In general, you just need to do the math. GPU instances on Amazon can go for $0.60-0.70 cents per her hour. Multiply that per machine. And then estimate how long it would take to train a model over a set of experiments on the cluster. I normally recommend starting with AWS to get your feet wet and understand the environment (and costs associated with). From there, you can break it down and determine if owning the hardware is more cost effective. By using AWS, you can at least get a baseline. I’trying to run Faster RCNN (https://github.com/rbgirshick/py-faster-rcnn) on AWS. I’ve installed Caffe and have tried following your tutorial on installing OpenCV on Ubuntu 14.04 (with python 2.7) and here, but it doesn’t seem to work—I’ve read that python bindings with GPUs/CUDA doesn’t work correctly. 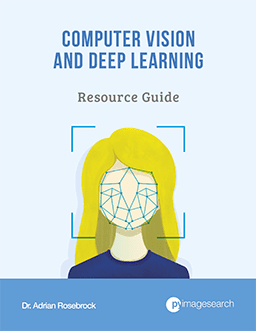 Is there a way you’ve found to install OpenCV on AWS w/ CUDA, w/ Caffe/etc. 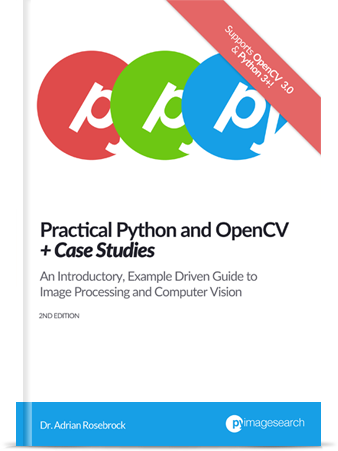 using python bindings, or would I just have to use the C++ versions of opencv? Thanks a bunch! Your tutorials are fantastic! I haven’t personally tried to use Faster RCNN, so I can’t comment directly to the question. I normally leave the when compiling OpenCV (especially when the NVIDIA drivers) since I’ve seen that cause a lot of problems. But yes, I have installed OpenCV, CUDA, cuDNN, and Caffe (with pycaffe bindings) open an AWS instance. I mainly use the Python bindings to classify images and pass them through the network. I’ve never used the bindings for anything else other than classification. I am trying to install caffe on an AWS GPU instance. I had one doubt, while you created the GPU instance you selected 15 GB of RAM but in one of the images of yours after you do ssh to the system it shows that 9.8% of 7.74 GB usage. Actually i am trying to work on a Problem in caffe that needs 10-12 Gb of RAM so i had this doubt. RAM (i.e., memory) and disk storage are not the same thing. You can increase the size of the disk storage (where your files are stored), but RAM is normally fixed on each machine. Your tutorials are fantastic and I learnt a lot from them!! 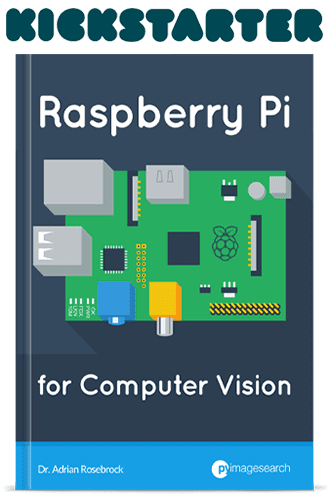 Actually I followed your tutorials and now, I am trying to connect Raspberry Pi 2 to the EC2 GPU instance so that the Pi can forward the image processing computations to the EC2 GPU and the GPU sends the results back to Pi. I have read on blogs that this can be done by socket-based implementation but no concrete idea is available anywhere. Can you please give a direction or any useful suggestion on how to do that? I would use a message passing library such as ZeroMQ or RabbitMQ. I will add this as a potential blog post idea to my list. 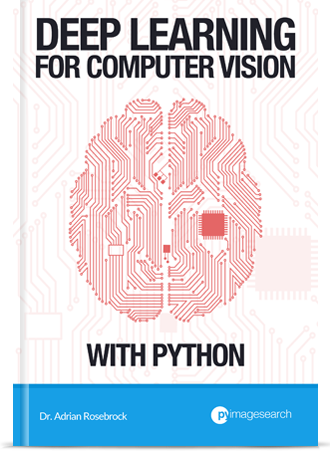 Kindly help me in machine learning, I am making my FYP, and I need help in lane detection using python-opencv using pycam. Could you tell me what was the speed that you noticed in Amazon AWS with your tiny DBN ? Was it similar to the speed that you noticed in your Mac with GPU drivers enabled ? As I mentioned in this blog post, you won’t get any substantial spread increases from your GPU unless your network and dataset is large enough. For toy datasets like MNIST you can see the time get cut in half. For deep networks on large datasets you can improve speed by multiple orders of magnitude.